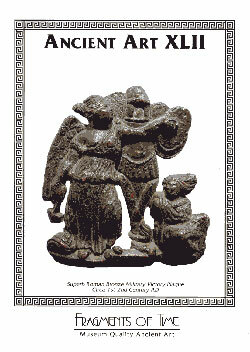 Catalogue Publication. Buying from a “dealer” who only operates over the web or in an anonymous online auction can be risky business. Fragments of Time is noted worldwide for its periodic full-color catalogues which establish a complete and perpetual paper record for many of the objects we offer. Fragments of Time’s expertly-researched catalogues are well-known to collectors, dealers and museums worldwide and are considered valuable reference tools. Such documentation helps assure and protect your investment in a work of ancient art. All clients automatically receive complimentary copies of our latest catalogues. Provenance. Today, provenance is more important than at any other time in the history of collecting antiquities. Our objects are acquired in observance of national and international laws, including the most recent Import Restrictions (19 CFR Part 12) enacted by the Department of the Treasury on January 23, 2001. Reputation. Fragments of Time enjoys a worldwide reputation for honesty and integrity. We believe passionately in the rights of individuals to own and collect ancient art, and we respect international efforts to stem the flow of illicitly excavated objects. We maintain strong ties with the academic and museum communities. Fragments of Time was selected in 2001 to disperse the Diniacopoulos Collection, one of Canada’s most important 20th Century private collections of ancient art. In 2008, Fragments of Time acquired in its entirety the collection of important Byzantine scholar Carroll F. Wales. In addition, I have the distinguished honor of serving on the Board of Directors of the International Catacomb Society with internationally renowned scholars associated with Harvard, Brown, the Boston Museum of Fine Arts, and a number of other world-class institutions. Expertise. With nearly 30 years of collecting expertise, Fragments of Time provides clients with a keen eye, highly competitive prices, and access to wide selection of museum-quality ancient art in all price ranges. Fragments of Time was officially established on January 1, 1994 … and while our name has been imitated, our reputation, expertise and service are never duplicated. Low Overhead. Without the overhead of a high-rent urban gallery, we are able to pass savings directly through to our clients. Whether you select an object from our website or from our catalogues, you’ll pay less than comparable objects offered elsewhere. Guarantee. Our objects are backed by our lifetime guarantee and are accompanied by our certificate of authenticity. High Service. Whether you are purchasing an object for $50 or $50,000, you deserve to be treated promptly and with respect. We pride ourselves on providing the very best service in the field, including careful, professional packaging and prompt shipment. Try us once and you will see the difference.